n this groundbreaking biographical study, Peter FitzSimons exposes the character behind this enigmatic politician – his ambitions, his back-room manoeuvring, and previously uncharted realms of his political and private life. Learning the rules of the game at the kitchen table, politics for Beazley was a family business. Handing out ‘how to vote’ cards for his father at polling booths, helping migrants at the Fremantle docks when his father was a Labor MP, and watching Labor Party meetings from outside the town hall window, Kim Beazley knew the gritty reality of politics before he became an elected politician in his own right. This is a revealing – and often surprising – portrait of the man who has had a quiet but profound effect on Australian politics. More than this, FitzSimons reveals hitherto unknown accounts of the Hawke-Keating battle, the move to privatise Australia’s telecommunications, and the Cheryl Kernot move to Labor. The author’s extraordinary access to Beazley’s diaries and letters, to his colleagues, family, friends, rivals and to the man himself, makes this a major political biography. Kim Christian Beazley (born 14 December 1948), son of Kim Edward Beazley, is an Australian politician and academic, who was Leader of the Australian Labor Party and Leader of the Opposition from 1996 to 2001 and from 2005 to 2006. As of 2007 he is Professor of Political Science and International Relations at the University of Western Australia. Beazley was a minister under Bob Hawke from 1983 to 1991 and under Paul Keating from 1991 to 1996. He was Deputy Prime Minister in 1995-1996. Elected Labor Leader in March 1996, he resigned in November 2001 after having lost both the 1998 federal election (despite gaining 51 percent of the vote, the party fell 7 seats short) and the 2001 election. He was returned unopposed to the Labor Party leadership in January 2005 following the resignation of Mark Latham, who polled worse figures at the 2004 election. He is the only ex-leader in the party's history to return to the position. He was replaced as party leader by Kevin Rudd in December 2006, a year prior to the 2007 election which Rudd and Labor won with a significant swing. 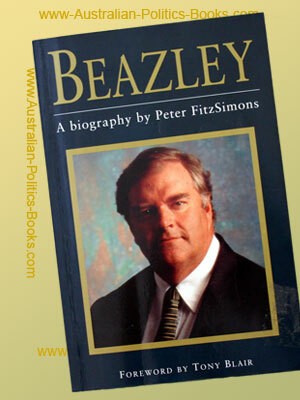 Beazley was born in Perth, Western Australia. His father, also called Kim Beazley and now generally known as Kim Beazley senior, was Labor MP for Fremantle from 1945 to 1977. His mother Betty Judge was a former Australian athletics champion and record-holder. The younger Kim was educated at Hollywood Senior High School and then later at the University of Western Australia and Balliol College, Oxford (Rhodes Scholar 1973), where he gained a Master of Philosophy degree. While at Oxford, he became close friends with Tony Blair and Geoff Gallop (a former Prime Minister of the United Kingdom and former Premier of Western Australia respectively). After returning to Australia, he tutored and lectured in politics at Perth's Murdoch University before being elected MP for the seat of Swan at the 1980 election. Beazley became a protege of Bob Hawke, Labor leader from 1983, and in that year he was appointed Minister for Aviation in Hawke's first ministry. He was Minister for Defence, with a seat in Cabinet, 1984-90. In this role he was responsible for establishing the Australian Navy's submarine program, which was beset with some technical problems and cost over-runs . Beazley has had a lifelong interest in military matters; his consequent enthusiasm for this portfolio, and particularly for military hardware, earned him the nickname "Bomber Beazley". Beazley was then Minister for Transport and Communications (1990-91), Finance (1991), Employment, Education and Training (1991-93), and Finance again (1993-96). He supported Hawke in his leadership battles with Paul Keating in 1991, but retained his position when Keating deposed Hawke and became Prime Minister in December 1991. Beazley was Deputy Prime Minister 1995-96. At the 1996 elections Beazley shifted to the safer seat of Brand, south of Perth. In 1996, on the defeat of the Keating government by John Howard, Beazley was elected unopposed as Labor leader and became Opposition Leader. He campaigned against Howard's Goods and Services Tax (GST) but lost the October 1998 elections by a narrow margin. Labor polled a majority of the two-party vote and received the largest swing to a first-term opposition since 1934, but failed to win enough seats in the House of Representatives. In mid-2001 Labor was well ahead in the opinion polls and seemed set to win the election due at the end of the year, but in August a political crisis erupted when the Howard government refused to allow the MV Tampa, a Norwegian freighter, to set down on Australian soil at Christmas Island several hundred asylum seekers whom the crew had rescued from an unseaworthy boat in international waters. When the November 2001 election was announced, Howard had taken a commanding lead in the polls and seemed set for a huge victory. But Beazley's dogged campaigning regained some of this ground and Labor suffered a net loss of only four seats. Beazley resigned the Labor leadership after the election and was succeeded by Simon Crean. But by 2003 Crean had failed to make any headway against Howard and Labor MPs began to fear that Howard would easily win the election due in 2004. Crean's opponents persuaded Beazley to attempt a return to the leadership by challenging Crean. The Labor Caucus (parliamentary Labor Party) re-elected Crean in June 2003, not convinced that Beazley offered a better alternative. Some Beazley supporters, most notably Stephen Conroy, continued to plot against Crean, and Beazley refused to rule out a further challenge. On 27 November Crean's closest supporters told him that he had lost their confidence, and the next day he announced his resignation. Beazley immediately announced that he would be contesting the leadership when the Labor Caucus met on 2 December. His only opponent was the party's economic spokesperson, Mark Latham. Latham defeated Beazley by 47 votes to 45. After the ballot, Beazley announced that he would remain in politics as a backbench member and would recontest his seat at the 2004 election. In July 2004, however, Latham arranged for Beazley to return to the Labor front bench as Shadow Defence Minister. This followed controversy over Latham's policy of withdrawing Australian troops from Iraq by the end of 2004. Beazley's return to the front bench was generally seen as a move by Latham to reassure Australian public opinion that a Labor government would not put the U.S.-Australian alliance at risk. After Labor's defeat in the October 2004 federal election, at which he became the longest-serving Labor member of the Parliament, Beazley again returned to the backbench, saying "my time as leader of the Labor Party has come and gone, it's over for me as far as leadership is concerned". But after Latham resigned as leader on 18 January 2005, Beazley announced his intention to contest the leadership, saying that he was "absolutely fired with ambition." Referring to widespread doubt that Labor could win the 2007 election under a leader who had already lost two elections, Beazley said: "There's no doubt in my mind that I can lead a winning team in the next election. The road to the prime ministership of this nation is a long and hard road. It's not an easy one. And there are many twists and turns on that road. I'm in my 25th year as a member of the Federal Parliament and I know this: public opinion is volatile and it can change." Beazley was re-elected as federal Labor Leader when the Labor Caucus met on 28 January, following the withdrawal of the other potential candidates, Kevin Rudd and Julia Gillard. Labor hoped that Beazley could follow a similar course to John Howard, who failed in his first term as Opposition Leader but returned in 1995 for a second term and then won the 1996 election. In September 2005, the publication of Mark Latham's The Latham Diaries contained comments by Latham to the effect that Beazley was a "dirty dog" and was not fit to "clean toilets in Parliament". Latham's abuse resulted mainly from two allegations: firstly that Beazley had engaged in a prolonged campaign to undermine Latham in his positions as a frontbencher and as opposition leader and; secondly that Beazley (as leader) had failed to provide support to Labor MP Greg Wilton, who later committed suicide. All of these allegations were vehemently denied by Beazley, his supporters and others. In the first half of 2006, Beazley focussed much of the Labor Party's parliamentary inquiry into the Australian Wheat Board (AWB) scandal, which allegedly involved bribes and kickbacks with the then Iraqi dictator, Saddam Hussein, that universally breached UN Sanctions, to which Australia was a signatory. The situation reached climax in the aftermath of Treasurer Peter Costello's 2006 Budget, whereby for the first time in recent Australian political history, the opposition leader and his colleagues ceased inquiry on the budget papers after just six questions, before resuming further questioning on the AWB scandal. The media criticised the ALP, although many ministers acknowledged the need for the Government to be held accountable for the AWB scandal. These tactical deficiencies plagued Beazley's return to the leadership and were amplified by factional infighting in the broader Labor Party, raising many questions concerning both his ability to lead and the stability of the party. At the time, opinion polls by ACNielsen and Newspoll on preferred leader had him at record lows. This was confirmed in a forum on the SBS Insight television program on 2 May 2006, which specifically dealt with the Labor Party's political struggles, where some community members voiced their concerns about being disillusioned with Kim Beazley, and a lack of understanding of the values and policies for which he and the party stood. While Beazley admitted that winning an election was difficult, he was adamant that the 2007 election would be a "referendum on the Howard Government's unfair industrial relations laws." After the mid-term parliamentary break, Beazley's fortunes slightly improved, with voter concern over interest rate rises, petrol prices and industrial relations giving Labor some electoral comfort. This was later evident in polls which suggested the ALP's primary vote was at around 40 per cent - the minimum considered necessary to gain government. However, polls concerning preferred leader still positioned Kim Beazley well below John Howard. Conservative political commentator, Piers Akerman, suggested in the Sunday Telegraph on 11 October 2006, that Beazley's poor performance in leadership polls was to do with alleged inconsistencies in policy and judgement, particularly with regard to the Iraq war. With continued weak performances in preferred Prime Minister opinion polls, Beazley's leadership of the Labor Party came under increasing pressure. Opposition to Beazley again centred around foreign affairs spokesperson Kevin Rudd and health spokesperson Julia Gillard. According to media reports, the New South Wales Right faction promised its support to Rudd for leadership so long as he challenged Beazley before Christmas. On 30 November, Rudd met with Beazley and announced his intention to challenge for the leadership. On 1 December, Beazley announced not only a leadership election but also that all frontbench positions within the Parliamentary Labor Party would be made vacant. Both sides claimed that they were in a winning position. A ballot was held on Monday 4 December, and Kevin Rudd was declared the winner and leader of the ALP, by a margin of 49 votes to 39. After the leadership results were announced, Jenny Macklin withdrew from the contest for deputy leader, which allowed Gillard to be elected unopposed to that position. Following the ballot, Beazley said of his political future, "For me to do anything further in the Australian Labor Party I would say is Lazarus with a quadruple bypass. So the time has come for me to move on but when that gets properly formalised I will let you know." It was also revealed that his brother David had died of a severe heart attack at age 53, shortly before the vote took place. Peter FitzSimons, born in Peats Ridge, New South Wales, 29 June, 1961, is a former Wallabies rugby union player. Now Australian journalist, author, radio presenter, and one of Australia’s most prominent and successful media and publishing identities.FitzSimons is a former Wallabies rugby union forward, playing seven Tests (including the distinction of being the only Wallaby ever sent from the field against the All Blacks.) Based in Sydney, Peter FitzSimons is a sports columnist and writer for The Sydney Morning Herald. FitzSimons also regularly appears on the Australian Foxtel programme, The Back Page, hosted by rugby league journalist Mike Gibson. For the Saturday edition of the Sydney Morning Herald, FitzSimons writes a humorous column titled "The Fitz Files" which looks at all the happenings over the past seven days in sport. He also writes a more general version of the "The Fitz Files" on page two of the Sun-Herald on Sundays, focusing on community activities and events in Sydney. In 2006 he began co-hosting a breakfast radio program with Mike Carlton on Sydney radio station 2UE. He was brought onto the 2UE breakfast show by management in January 2006 in an attempt to boost the program's dwindling ratings. Mike Carlton was vocal in his opposition to having an on-air partner, but the move immediately paid dividends with an immediate audience increase. However, the "Mike and Fitz" breakfast show still trails a long way behind the current number one program on 2GB, hosted by Alan Jones who coincidentally coached FitzSimons at the Manly rugby club and when he was a Wallaby. FitzSimons was often joined on air by his wife, Nine Network Today Show presenter Lisa Wilkinson. After two years on Breakfast with Mike and Fitz, Peter FitzSimons hung up the headphones to become a stay at home Dad and focus on his writing. Mike Carlton has thanked Fitz for the "most fun" he's ever had on the radio. FitzSimons is an established author with such books as Kokoda, which recounts the numerous battles between Australian and Japanese Troops on the Kokoda track during World War II, and biographies of former Australian Labor Party leader Kim Beazley, Nick Farr-Jones, John Eales, Nancy Wake and Steve Waugh. Also Tobruk, which recounts the story of the Rats of Tobruk as they fought during World War II against Italian, then later the Afrika Korps as they were led by General Erwin Rommell. He is married to Today host Lisa Wilkinson, with whom he has three children. He is a former student of Knox Grammar School at Wahroonga, Sydney. His son Jake FitzSimons also attends Knox Grammar School.